Bolivia has to be one of the most stunningly beautiful countries in Latin America - a country full of epic scenery, fascinating indigenous cultures, and wild and remote landscapes unlike anything you'll see elsewhere. The salt flats of Uyuni are perhaps the most dazzling, but Lake Titicaca's expanse of blue encircling the rugged rocks of the Sun Island, and Sajama's snow-capped volcanoes popping out of the vast wilderness of the altiplano are just two of the other grand vistas on offer in this brilliant country. Travelling mainly in 4WD vehicles, the best way to capture Bolivia has to be through the camera lens. On this trip we are accompanied by our photographer James Brunker, one of Explore's ex-Tour Leaders who fell in love with the country and has now become a Bolivian national, living in La Paz. There could be no one more suited to helping you get the perfect photographs of this impressive destination. There's no need to be a pro with a camera on this trip - even if you're not a photography enthusiast there will be a local Explore Leader on the trip to get you out into the spectacular scenery. The great photos are just a bonus! Customers who have booked their own flights will arrive and check-in at the first night's accommodation in La Paz. Customers who have booked flights through Explore will spend the first night of the trip on an overnight flight. This morning sees the arrival of any customers who have booked flights through Explore. After a free morning to relax and catch up on sleep, this afternoon we will take a leisurely walking tour of the bowl-shaped 'city that touches the sky', with the downtown area located at around 3600m altitude. Luckily our walk is all downhill! This is a walking tour with a difference, as we are joined by two of the city's shoe shiners to take us through the popular local neighbourhoods and markets of La Paz, including the popular 'Belen dining room' where rows of food stalls sell lunches very cheaply to the working population in the area. It provides a fascinating look at this mad city, outside of the usual tourist routes. Our Explore Leader will be on hand to translate from Spanish. Our centrally located hotel is an excellent point from which to explore La Paz's downtown area on our free morning, including the Witches Market, the beautifully decorated San Francisco Church, or to discover the Pre-Columbian artefacts in the Museo de Oro. We're waiting for the good light in the afternoon to set off to the atmospherically named Valley of the Spirits, around 1 hour to the southeast of La Paz city. From our stopping point we set off on a 3 hour hike into Palca Canyon. It starts off with a roughly 5km downhill across farmland paths, descending into the canyon as its gothic spires and rugged rock formations rise above us, some almost 200 metres tall. The roughly 3km long rocky path winds and twists through the canyon floor, as the silence echoes around us, before arriving into the village of Palca, which lies below the impressive Mt Illimani, offering spectacular sunset shots over the canyon before our return to La Paz. From La Paz we head towards the deep blue waters of Lake Titicaca. At 3810m it is the highest navigable lake in the world and its sacred waters have long been a site of religious ritual and devotion for the Aymara and Quechua populations that make the lake their home. Our journey takes us to the town of Copacabana, a place of mystic reverence since the times of the Tiahuanaco, and now a pilgrimage site for many Christians. We explore the Virgen Morena and its church before boarding our boat to the Island of the Sun, landing in Huacani port. Here we are treated to a typical 'aptapi' - a traditional indigenous lunch usually involving potatoes, corn, lima beans, trout or chicken, cooked up and served on a communal table. After lunch we jump back onto the boat where we land at the Pilkokaina Ruins and walk up to our incredibly situated eco-lodge, where we will be spending the night (approx. 200m ascent +1-1.5 hrs of walking at high altitude). You will be carrying an overnight bag with you on this walk and we will have the assistance of mules or donkeys. In order to not overload the animals, we will bring only what is necessary for one night and leave any extra luggage in Copacabana. If you have expensive photography equipment we do recommend that you bring it with you. The Isla del Sol is the largest of the islands that lie dotted around this spectacular lake, lying just off the Copacabana Peninsula. The island is covered with nearly 200 archaeological sites that attest to the importance placed on this site by the ancient Incas. This morning, we take a short hike in the morning to discover the vistas over the lake, before walking down to the port and taking a boat to the neighbouring Island of the Moon. Here, the ruins of Inak Uyu (Temple of the Moon) are a very well preserved nod back to the island's ancient history, and an excellent place to take a hike up for more stunning views over the islands. It's a short but steep hike that takes us above Inak Uyu to the island's peak. We return later this afternoon to the Island of the Sun, and walk back to our ecolodge. Photo opportunities are plentiful and as always James will be on hand to help us make the most of them. This morning we return across the lake to Copacabana by boat, and then by bus to La Paz, a 4 hour journey. On arrival into El Alto, a city in itself just to the north of La Paz, we will get off the bus and take two cable cars down to the hotel - a quicker and more scenic way to arrive! We have an early start today as we jump into 4WD vehicles, heading south out of La Paz, crossing the highlands and the waters of the Desaguadero River. After approximately two hours we visit the old adobe church of the village of Curahuara de Carangas (which the Lonely Planet terms 'the Sistine Chapel of the Altiplano'!). Luck permitting, the church should be open for us to see the 17th-century murals that depict typical mestizo themes - a mixture of Spanish Catholic and indigenous cultures - including the three kings visiting Jesus with their llama train. Situated in the middle of nowhere, the remoteness will become a theme over the next few days - the landscapes in this area are fantastic. We'll be stopping on our drive to explore valleys of rocks with great formations caused by wind erosion, as well as some ancient burial towers, or Chullpas, found en route. We continue to the National Park (at approximately 4200m altitude) and our simple accommodation to check-in, before heading out again in the afternoon. We enjoy a hike in the surroundings of the National Park to see the wetlands formed by water coming off the glaciers, ideal for raising llama, alpaca and vicuna, which are plentiful on the shrub of the altiplano. The conical volcano of Sajama is ever present, looming in the background and adding some grandeur to our pictures. Starting off at the Macaya church, we head to the Lauca River where we find some 20 pre-Hispanic burial towers, each decorated with a striking geometric pattern that looks quite incongruous against the sparse background. It's a shot of civilisation in the wilderness. We then head to the Laguna Saquewa in our vehicles, where Andean flamingos roam, before visiting the naturally occurring hot springs where we can take a dip whilst taking in the magnificent views of Mt Sajama. We have a long day of driving today, as we have an 8 hour journey from Sajama to the small village of Tahua, situated at the north of the Uyuni Salt Flat and beneath the Volcano Tunupa. En route there are many stopping points for photos, one of which is at the Coipasa Salt Lake - Bolivia's largest salt flat after Uyuni, where thousands of flamingos have inhabited the shores. Despite the proximity to Uyuni and the salt flats, the whole area from Sajama to Tahua is quite free of tourists, and it is surrounded by impressive mountain scenes. There are some small communities to discover en route. We plan to arrive at Tahua in time to see the sun set. Exploring Bolivia's immense, other-worldly salt-flats is an unforgettable and surreal experience. We'll be aiming to get to Incahuasi Island, in the centre of the flats, to capture the sunrise as it appears over the mountains in the distance. Once the sun has risen, we'll explore the island a little - the cacti here have been here for millennia, and the tallest towers 9 metres above the floor of the plains. Heading down back to our 4x4s, we drive onto the blinding-white plains where the sky seems to almost disappear into the land. There will be several stops on the salt lake - the flat light in the middle of the day has an interesting effect on perspective, which sometimes the guides like to play around with. It can be cheesy but makes a memorable photo. After a few hours enjoying the flats, we continue to San Pedro de Quemes (approx. 4,000m altitude) where we can spend the afternoon relaxing after our early start and enjoying the remote location, only a few metres from the historical ruins of the 'Pueblo Quemado' (burnt town) of San Pedro. Home to three different types of flamingos (Andino, James and Chilean), as well as many other species of birds and wild ducks, today we visit a chain of lagoons that are a pocket of life in the wilderness. One of the lagoons, the Laguna Hedionda, is so called for its sulphurous odour (hedionda means foul-smelling), and it is also one of the highest points of our trip at 4531m altitude. After the last lagoon, we enter the Siloli Desert, a barren stretch of land without roads or tracks, where the bright oranges, rusts, browns, reds and coffee colours pop out against the blue sky. Our hotel for the night appears as if out of nowhere - given the remote setting, the rooms are basic compared to a city hotel, but the views from the communal areas are simply stunning. Right at the bottom of the country, near the Chilean border, lies the Eduardo Abaroa National Reserve, an extreme otherworldly wonderland of volcanoes, hot springs, geysers, lakes, fumaroles and birdlife that is one of Bolivia's most important protected areas. One of our key spots for today is the Red Lagoon, a shallow salt lake which takes its name from the deep red algae that covers its breadth. It was declared a RAMSAR site (a wetland of international importance) due to the nesting of over 30,000 flamingos within its waters, their pink feathers blending into the red of the water. The Laguna Verde on the other hand, varies its colour from turquoise to dark emerald depending on the wind, which disturbs the minerals and sediments as it whistles past. The colour is intense next to the imposing mountains that emerge from the shore. 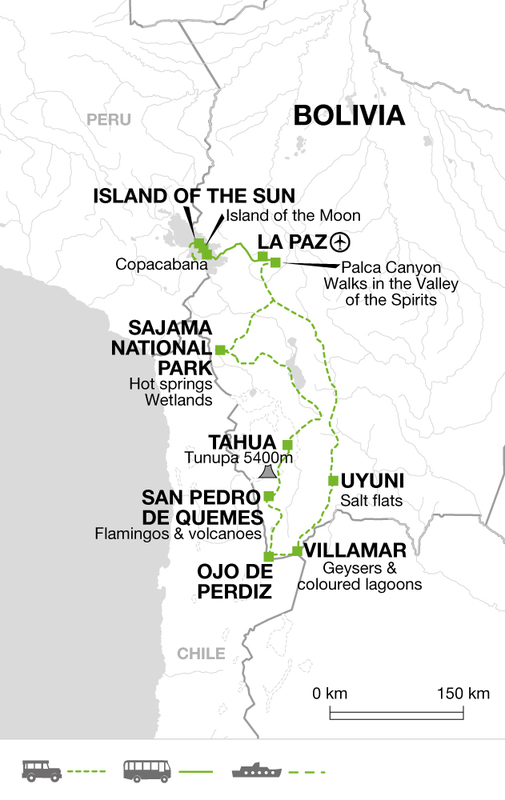 The Reserve is stuffed full of impressive sites, and we'll also be able to watch the rumbling and bubbling of the Sol de Manana geysers, as well as heading to the Challviri hot springs and the 'Salvador Dali' Desert, a barren valley whose landscapes resemble the artist's famous surrealist paintings. We continue to Villamar and our hotel. After a couple of days of early starts, we'll have a lie-in this morning. Alternatively the area around the hotel is very scenic, and there is the opportunity to have a walk around and capture some more images within this wild landscape. In the mid-morning we head back north up to the salt flat again, through the giant rock formations of the Valle de las Rocas. We stop along the way for some photographic opportunities, passing through the small villages of Culpina and Alota, through a landscape peppered with volcanoes and lagoons, and on to the train cemetery near Uyuni. This atmospheric place is a relic of the time when Uyuni was a distribution hub for trains transporting goods through Bolivia to the Pacific Ocean. Now it's a quirky stop with some great photo potential as the rusting carcasses of these ancient trains sit almost beached up on the high plains, backed by mountains in the distance. We'll arrive at our hotel at about 4pm this afternoon - impressively located right on the edge of Uyuni's salt flat, and even more impressively, made completely out of salt, right down to the llama sculptures in the hallways! We will be doing a night photography session on the flats this evening, hopefully with maximum starlight! We have a full day's drive today, as we return to La Paz from Uyuni. It usually takes about 8-10 hours, but there will of course be points to stop en route. The final meal for this evening is at a folk show in the centre of La Paz, where we can experience the diversity of folkloric singing and dancing from across the different climatic zones of the country, from the Andes to the valley and the tropical regions. The performers play handmade instruments such as zamponas (bamboo flutes) and charangos (small guitars made of wood or armadillo skin). Our trip ends this morning at the hotel in La Paz. If you've booked your flights with Explore, there may be a long wait in the airport in Lima due to the flight timings from La Paz. We've included a city tour in Lima so that you can explore this lively coastal city. You'll discover the San Francisco Monastery, one of the most spectacular colonial churches in Lima, where you'll visit the catacombs. In the Old Town you discover the main square, where the Presidential Palace, Cathedral, Archbishop's Palace and City Hall buildings are all located - testament to the city's tradition of fine architecture. The tour goes all the way out to the modern district of San Isidro, where you'll see the pre Incan pyramid of Huaca Huallamarca and its distinctive adobe constructions. Finally, finishing in the Miraflores district we'll have chance to grab lunch in one of the city's many restaurants. It's well worth trying the local dish - ceviche - a delicious mixture of fish marinated in lime juice, with corn, red onions and other accompaniments. You'll be taken back to the airport for your flight home at the end of the tour. As everything on this tour is included, there is very little down time for extra excursions! Temperatures at altitude can drop considerably, particularly at night, and you will certainly need warm clothing for the evenings (particularly for any astrophotography that we may be doing), including thermal underwear, a well-insulated fleece/jacket, a thick sweater and a hat, scarf and gloves. Bring something warm to sleep in. Lightweight raingear is essential at any time of the year. In the days temperatures can be warm, so lighter layers are useful. A sunhat and sunglasses are advisable, as is high factor sunscreen and lipsalve with sun protection, due to the thinness of the atmosphere. A torch will be essential, particularly a head torch, not just for the remote accommodation where power cuts can happen, but also for the sunrise visit to the Incahuasi Island, as you will be walking in the dark. Camera equipment goes without saying - please be aware that you will be hiking in some locations, for example in Palca Canyon and on the Isla del Sol, and this will be at high altitude so be realistic with the equipment that you bring. Spare batteries and memory cards are a good idea. A tripod may also be useful for night photography. Some of the accommodation on this trip is a real highlight. We stay in not one, but two salt hotels. One is the incredible boutique salt hotel near Uyuni, where the domed roof of each room is made from bricks of salt, and salt statues adorn the corridors. The other is at the foot of the Volcano Tunupa, and has a more rustic feel. You should be prepared for most of the accommodation in Sajama and around the salt flats and lagoons to be more basic - as they are at high altitude often rooms can be cold with temperamental heaters not working, and many of them work off solar power to heat water. These hotels, while sometimes lacking in amenities, make up for it with good service levels, friendly staff and amazing locations. One important thing to note on this trip, particularly in the cities, is that Andean people are notoriously shy – it can be difficult to take good portrait shots, and in many cases people will actively turn away from cameras. We recommend that travellers respect this and try not to be intrusive with photo-taking in the cities. Luckily you'll have no such reaction from the wildlife - llamas and alpacas are more than happy to pose for you! There's no need to be a pro with a camera on this trip - even if you're not a photography enthusiast there will be a local Explore Leader on the trip to get you out into the spectacular scenery. The great photos are a bonus! Supported by our expert photographer, you don't need to think about anything else as everything within the itinerary, including almost all meals, is taken care of. This means that the price given is almost all-inclusive. Everything down to the location of hotels has been chosen for its scenic potential, and proximity to Bolivia's epic landscapes. We also have a departure set to coincide with the rainy season on Bolivia's salt flats, where the mirror-like reflections are out of this world.